THIS ARTICLE FIRST APPEARED ON EXCEPTIONAL COMFORT. The butternut squashes are at the farm markets in Loudoun County, VA! Can it really be time for fall cooking? Well, the kids are back in school and a few trees are already starting to lose some leaves. Nuts crush underfoot while walking on the black paths. Fall can’t be far behind and it is time to begin the shift in the kitchen to some warming, nourishing soups! You will love this one! I can’t get enough, and I am looking forward to getting more squash to make some more! 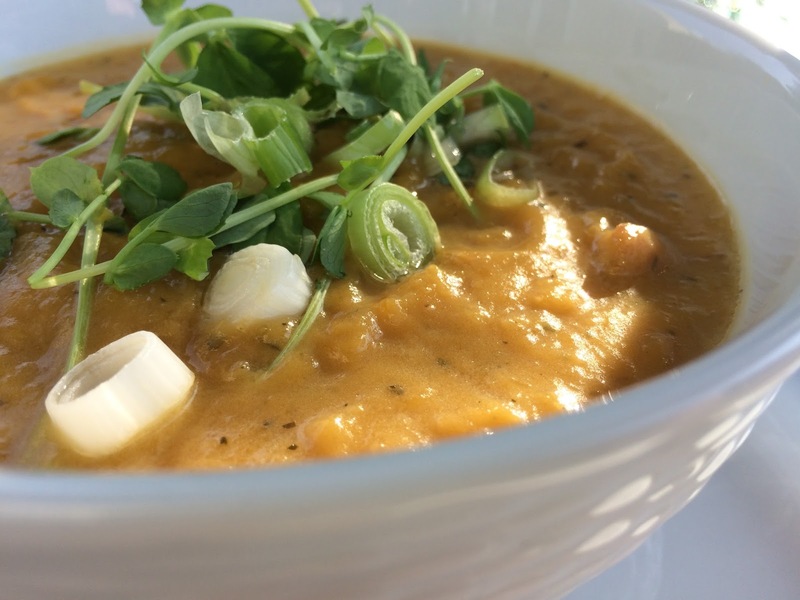 A few extraordinary key ingredients make this soup spectacular besides the squash! Apples give the soup a brightness – I roast them alongside the squash and onions on a cookie tray. The Bone Broth – I make from scratch. It is WORTH IT! See recipe here. And finally the herbes de Provence – gives the soup a unique blend of French thyme, sweet basil, Greek oregano, Italian Parsley, French tarragon, rosemary, and sage. It is transforming. Preheat oven to 400 degrees Fahrenheit. Distribute squash, onion, and apple over two cookie sheets with rims (jelly roll pan). Drizzle lightly with olive oil and coat evenly by moving everything about with your hands. Salt and pepper the trays and roast for 15 minutes. Turn over with a spatula, and continue roasting for 30 minutes more. They should be tender and have some browning/caramelization starting. Place the vegetables and apples in a large Dutch oven. Add the bone broth and herbs de Provence. Bring all to a simmer on medium heat. Reduce to low, cover, and simmer for 30 minutes. Remove from heat and use an immersion blender to puree the soup. I like to leave a few chunks for textural interest. Add cream then salt to taste. Return to medium low heat until heated through completely. Serve warm with scallion and pea shoots as a garnish.